A finger print can serve as identification to access locked doors and more, but current scanners can be duped with fake or even similar fingerprints. That may change soon, thanks to a collaborative research team based in Japan. 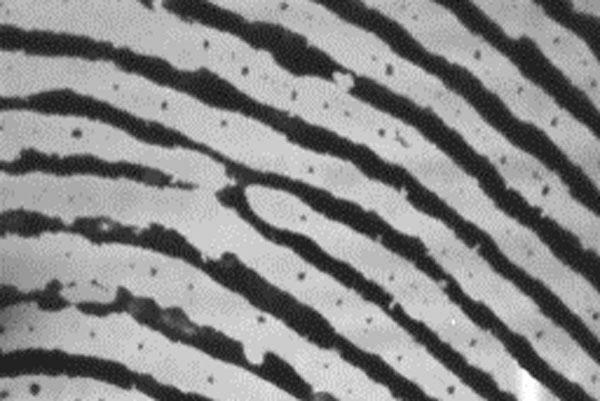 The group has developed a new proximity capacitance imaging sensor that has such high sensitivity and resolution, a finger print scan shows more than the swirls of a fingertip – it detects the sweat pores between the ridges. The prototype sensor was first presented in December at the 2018 IEEE International Electron Devices Meeting in San Francisco, California. A paper describing the details of the sensor was published in the Technical Digests of 2018 International Electron Devices Meeting. Last week, the authors presented new materials and results from the study at a conference organized by the Institute of Image Information and Television Engineers (ITE) in Japan. “The most significant point of the developed sensor is its high capacitance sensitivity,” said paper author Shigetoshi Sugawa, a professor in the Graduate School of Engineering at Tohoku University. Many touch screen phones and computer track pads use a less sensitive capacitance sensor, where the differences in electrical properties between a sensor and a conductive tool (such as a finger) allow the device to react to scrolling or double clicking. The capacitance increases when the object is closer – the double-click versus lighter scrolling. The high sensitivity of this capacitance sensor is derived from newly introduced noise reduction technology, according to Sugawa. The sensor chip contains pixels to detect the capacitance between the sample and detection electrodes. Each pixel has one detection electrode attached to it that’s capacitively coupled with a ground wire. These electrical signals are converted into images of the samples. Previously, the signals would pick up background noise such as thermal noise and noise due to variability of electrical components of pixels, which made for lower-quality images. To fix this, the researchers applied reset switches to the detection electrodes and employed a voltage pulse to produce a circuit that can follow the source of noise. The reset switches allow the systems to detect noise arising at the detection electrodes. The voltage pulse alternates the two voltage levels after the reset switches are turned off, effectively cancelling out and removing noise from the system. It’s the equivalent of removing the white and black snow from a television without signal input into a smooth, grey screen. It’s much easier to sense any deviation on a solid background. “This development is important to the general public because it can improve the efficiency of analysis and control in the fields of electronic industry, authentication, life sciences, agriculture, and more,” Sugawa said. Next, Sugawa and the researchers plan to optimize the sensor for specific applications, such as the non-contact inspection equipment of printed circuit boards and flat panels as well as a portable camera system with the developed sensor chip. The research team consists of Sugawa, as well as Rihito Kuroda, an associate professor, Masahiro Yamamoto, Manabu Suzuki, graduate students both with the Tohoku University’s Graduate School of Engineering; Tetsuya Goto, an associate professor with Tohoku University’s New Industry Creation Hatchery Center; Hiroshi Hamori, president, Shinichi Murakami and Toshiro Yasuda, at OHT, Inc. The prototype sensor was first presented in December at the 2018 IEEE International Electron Devices Meeting in San Francisco, California. A paper describing the details of the sensor was published in the Technical Digests of 2018 International Electron Devices Meeting. On March 22, the authors presented new materials and results from the study at a conference organized by the Institute of Image Information and Television Engineers (ITE) in Japan.